Bonnie Cashin, born in Fresno, California in 1908, had a very successful costume and clothing design career spanning sixty years. Cashin began designing for herself at an early age, working as an ‘apprentice’ for her mother Eunice, a custom dressmaker and dress shop owner. Moving back and forth from California and New York, she had designed for dance companies, film in Hollywood, uniforms for the WWII effort and ready-to-wear. By the time Cashin left Hollywood and came back to New York in 1949, she had been designing for over twenty years. In 1951 she started Bonnie Cashin, Inc declaring herself independent from the garment industry. 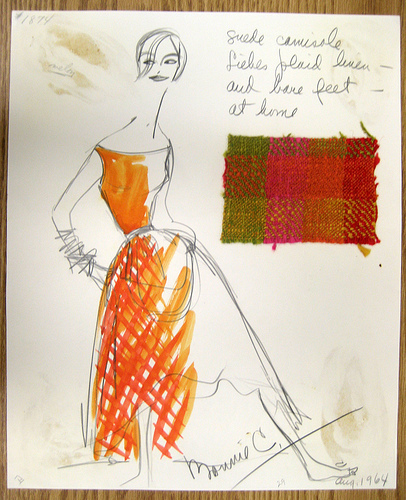 She began working with Philip Sills, of Sills and Co. in 1952, for the 1953 fall season. 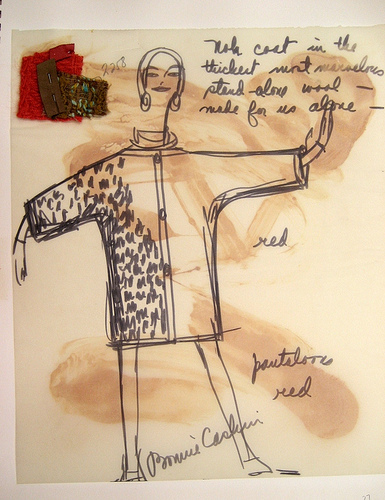 By then she was known for her ability to use design ideas and take inspiration from her extensive travels and unusual sources, far removed from the fashion world, as well as her creative use of unusual textiles. Cashin designed for many other businesses while she was working with Sills. 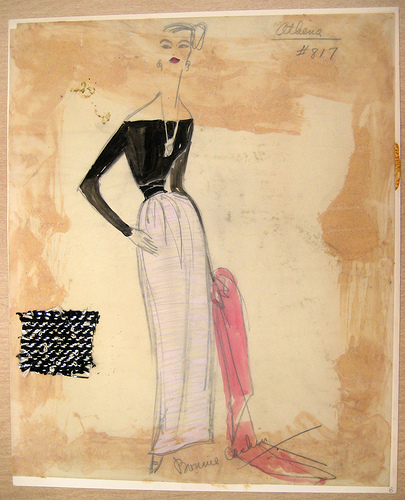 Cashin received both the Coty Fashion Critics Award and Neiman Marcus Award in the same year, 1950. She went on to receive a second and third Coty Award in 1961 and 1968. In 1972 she was inducted into the Coty American Fashion Critics Hall of Fame. 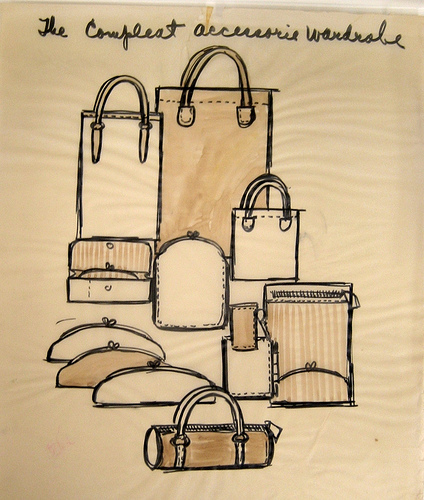 She also received the Leather Industries American Handbag Designer Award in 1972 and 1976. 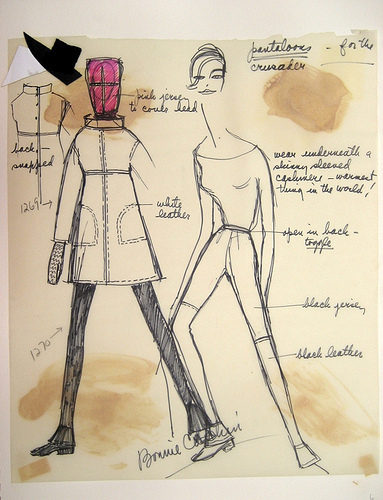 The Department of Special Collections and FIT Archives acquires, preserves, and provides access to a wide range of primary research materials in their original formats, including archives, scrapbooks, oral histories, fashion sketches, illustrations, books, journals, and other items. Subjects include the apparel industry, fashion and regional costume, textile design and the textile industry, the FIT Archives, and, to a lesser extent, art, architecture and interior design. Department personnel are committed to supporting research by FIT students and faculty as well as designers and researchers from the apparel and textile field, other industry professionals, and scholars. This entry was posted in Treasure of the Month and tagged Bonnie Cashin, Coach Leather, Sills and Co., Special Collections. Bookmark the permalink. It’s wonderful to view this sophisticated blog. Thanks for putting it together.